It is that time of year when the snow is melting and we are keeping an eye on our trail cameras to know when antler begin to drop. I look forward to the nice sunny days when I am able to walk through the woods in pursuit of finding sheds. I know this sounds obvious, but in my early days I would get easily side tracked and end up walking down countless trails. Now I begin where I know the deer hang out. Food sources and bedding areas. Food is typically limited during winter months; therefore, deer will spend a lot of time in these areas. Next, I head to any obstacles that deer may have to jump across such as fences, steep ditches, and creek jumps. If a deer is carrying a loose antler, a jump will jar a buck’s body and may pop the antler free. I have found many antlers lying in cow pastures not far from the fence! I always check travel routes. If you have snow or wet ground, you will be able to pick out the deer “highways.” You can then follow the tracks and trails which may lead you to great shed hunting locations and to rubs that you haven’t seen before. Shed hunting is not a race. Although it feels good to be the first one in your group to find a shed, rushing through the woods is not going to help you. Shed hunting should be relaxing and stress free. I like to walk slowly and stop…and do a full 360 of the area often to get a view from different angles, as sometimes antlers that you didn’t see before will pop out at you from another angle. 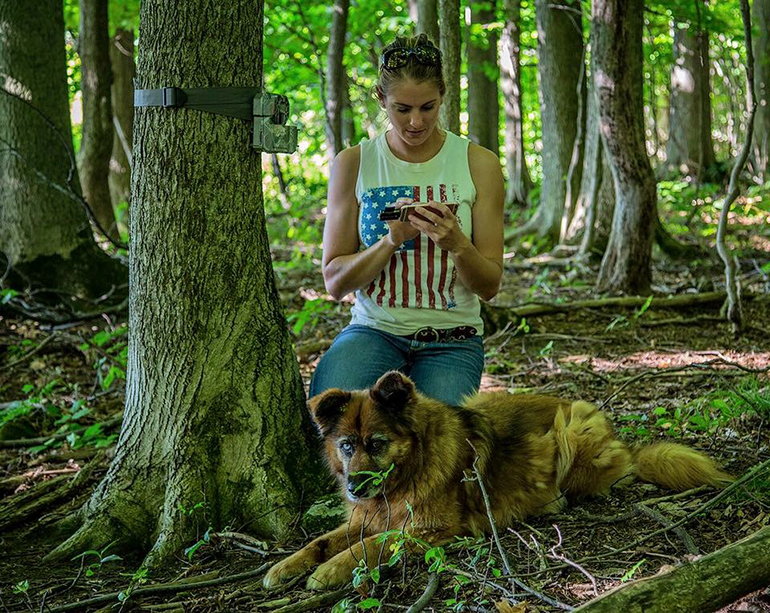 Also remember to look down, we often scan the areas around us, but remember to look around your feet because you just might be walking right next to an antler that you didn’t see from a distance. 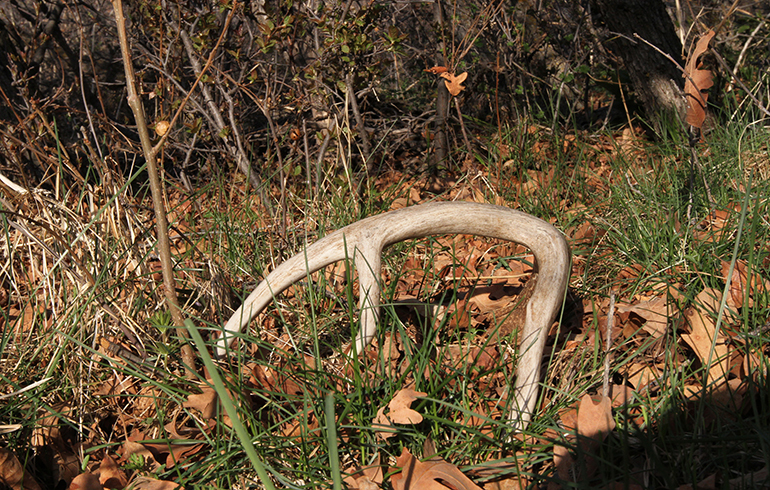 Many times people go out shed hunting and they expect to find a full antler. Seeing a full antler sitting out in the open does not happen often. Instead train your eye to look for parts of an antler. Look for the curve of a main beam, or for the tip of a tine sticking out of the leaves. By training your eye to look for parts of the antler and not the entire antler, you will find yourself finding much more success while shed hunting. Shed hunting can be a great way to get family and friends outside enjoying the outdoors. When I hit the woods my goal is to first and foremost enjoy the outdoors and if I happen to find a shed, that is just icing on the cake!